Sweltering teenage boys beat their school’s strict uniform policy by wearing skirts. The 14-year-old pupils were punished for wearing shorts in a bid to keep cool on the hottest day of the year. In protest the lads decided to borrow from the girls’ official uniform. Michael Parker, Kodi Ailing, George Boyland and Jesse Stringer were allowed to wear the pleated skirts as they are within the school’s rules. 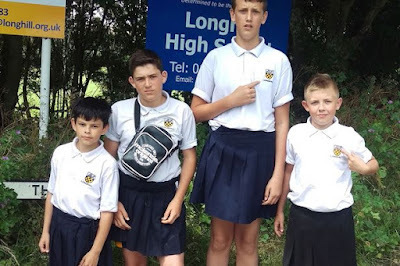 The students at Longhill High School, in Brighton, East Sussex, donned the skirts in protest of the school’s decision to punish boys who wore school-issued PE shorts rather than trousers on Tuesday. His mother Angela, added: “We’re fully in support of the boys."